POLSON – A Pasco, Washington man was sentenced to five years in the Department of Corrections last week for criminal possession of illegal drugs with intent to distribute. 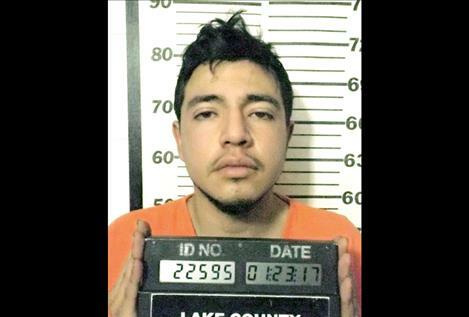 Leonardo Rafael Perez, 18, was arrested following a Jan. 23 traffic stop after his vehicle was found in a ditch off Montana Highway 28. Perez declined to allow law enforcement to search his vehicle, a 2008 Toyota, so a search warrant was obtained and police found 480 grams of methamphetamine and 380 grams of marijuana in a backpack, a court document states. County Attorney Steve Eschenbacher asked for a 20-year sentence with 15 suspended, and defense attorney Ashley Morigeau asked for a three-year deferred sentence. Morigeau said her client was enrolled in a GED program and had gotten a job at a hotel. Manley said the 480 grams of meth represented 480 to 960 “hits” of the narcotic. He said Perez grew up in a gang-related area and had seen people killed or stabbed in front of him. Perez pleaded guilty without a plea agreement and was given credit for one day in jail. Manley ordered that Perez be screened for chemical dependency, criminal thinking and education programs. A charge of criminal possession of drug paraphernalia, a misdemeanor, was dismissed.